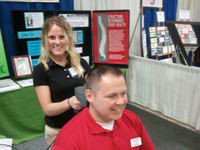 Jamie doing a screening at the 2012 Homebuilder’s trade show, one of many that we do throughout the year. In certain situations, and in the professional judgment of Dr. Ziolkowski, we sometimes make exceptions. It just depends on your unique situation. After this appointment, you will then be instructed to schedule your regular visit.